The CORMORANT under Capt. Bruce Matson's guidance was near JJ-buoy by the island of Kaho'olawe when they hooked a monster marlin on a huge Coggin straight-runner lure. Doug Jorgensen fought the fish with a 130-class Penn International outfit and Maxima line. 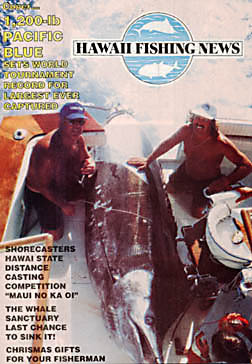 This fish won the Lahaina Jackpot and was the largest marlin ever caught in a major game fish tournament anywhere in the world at the time.